All the lessons, ideas and resources related to MinecraftEDU here are FREE and licensed CC-BY Wesley Fryer. In November 2013, my school at that time (Independence Elementary in Yukon PS) purchased 29 licenses of MinecraftEDU software to use in our Win7 computer lab. In 2014-15 MinecraftEDU was one of the stations / centers in my STEM classroom Maker Studio. Also check out my Minecraft STEM Ideas Pinterest board. If you are a teacher just getting started, check out this official "Teaching with MinecraftEDU" resource page. Also see "Tutorials/Creating a challenge map." In summer 2015 when I became the director of technology for Casady School, we purchased 80 licenses of MinecraftEDU to use in our computer labs. I am continuing to use and update these MinecraftEDU resources both for use at our school, in MinecraftEDU summer camps, and after-school Minecraft activities. This website includes a variety of lessons and challenges for MinecraftEDU. In January 2016 Microsoft (which had purchased MinecraftEDU) announced a new version which requires student web logins and appears to integrate with Microsoft365. It's quite a bit different than prior standalone versions of MinecraftEDU. This website currently includes lesson resources for legacy MinecraftEDU program and school server platform. MinecraftEDU 1.7.10 was the latest version we downloaded and still use. Lesson resources for this project have been moved to a separate page. Build a house including a living room with an exact AREA of 50 Minecraft blocks. 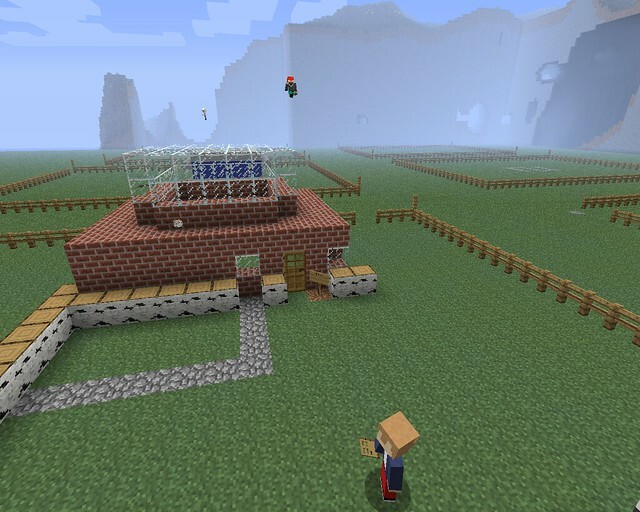 Build an animal corral or area outside the house with an exact PERIMETER of 24 blocks. Check out this 15 minute guided tour of some AMAZING Minecraft Creative Builds by Edgar, a 4th grader in Mrs. McAlister's class! This Space Shuttle and Galley Ship were built by Shon (4th grade) in Minecraft Pocket Edition. The MinecraftEDU Controls Quickstart Guide (PDF) is available for students not familiar with Minecraft on a PC. Alexander Fryer's 30 minute K-12 Online Conference presentation in 2012: "Creating and Playing in Minecraft"
Please share other resources to add to this page by tweeting @wfryer.